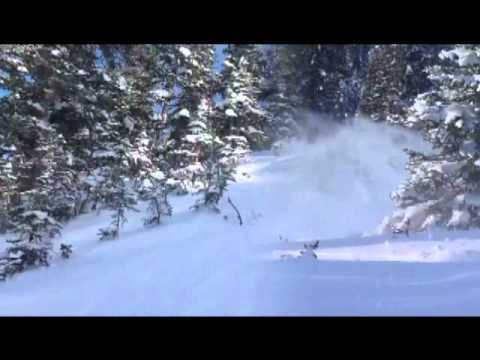 It’s been a tricky winter for Colorado Front Range powder hounds. Unlike last year, when there was record breaking snow totals close by, this year has required some real effort to find the fresh. Fortunately for me I’ve had the flexibility to chase some storms and good luck when the snow did fall locally. One part of Colorado that has not lacked for snow has been the Southwest. Silverton Mountain seems to do well no matter where the storms are coming from but does particularly well in southwest flow which has been our main weather pattern this year. Having not been there for several years and desperate for some deep I headed there in late January to see what was new in their world. As it turns they have added some major additions to their repertoire. The milk truck has been replaced by buses with comfy seats but more notable is the helicopter that now permanently resides there. This allows access to terrain which previously would have been unreachable unless you wanted to hike the entire day. As you can see from the photo below Silverton has some excellent sustained pitch and plenty of snow. My issue has always been the required group guiding – invariably I end up with some folks who don’t belong on the mountain and this trip was no exception. We started our day with a 1000′ vertical hike (photo above – we hiked to just below the billboard at top) which led to the terrain in the photo below. The hike was challenging and the run fun but by 2:00 I had only gotten in one other run and was a tad frustrated. At that point I switched to the helicopter (they were running a two for one special) which got me to some new terrain but nothing to write home about (or more accurately, not necessarily worth driving 7 hours for). I was supposed to spend two days at Silverton but couldn’t bear to spend another full day getting just 5 runs and besides there was a storm coming from the north so I decided to head back. 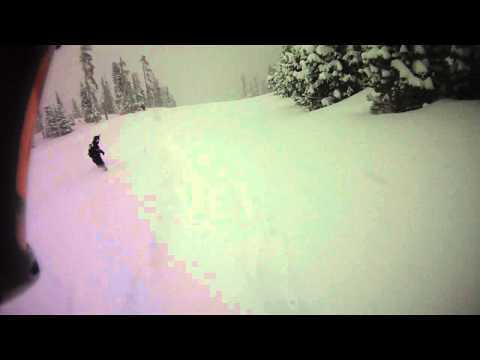 I originally intended to check out Powderhorn but when Vail called 12″ and still snowing I changed tracks and drove like a madman to catch the opening of the back bowls. I don’t have any footage or pics from that day because the snow was so sweet and deep that no one wanted to waste time taking footage so you’ll just have to believe when I tell you it was truly epic. And speaking of epic, while I have flown all over North America sampling powder I have never ridden any better snow than the 24″ in 24 hours that Eldora got on February 3rd. The video above doesn’t do it justice but anyone who was there will surely agree that it was as light as it gets. This was my third great day at Eldora this season as those same storms that pound the southern mountains often deliver big upslope snows to the front range. One place that had been notably missing from my usual winter rotation was Berthoud Pass. Besides the fact there has been very little snow, what did fall in the early season has become a very shaky and dangerous base in the backcountry. By this time I would normally have quite a few days on the pass but this year my first was in mid February when the avy report finally lowered the danger rating to a tolerable level. As always, like the picture above indicates, there was fun to be had but the terrain options were severely limited. It still was mighty nice to visit one of my favorite spots and the photo below gives you a good idea of why I keep going back there. But no matter what the year there is always one place that comes through for me and that is Wolf Creek. This year of course every one has heard about the great snow that falls during a southwest storm track and I have never seen so many front rangers on the mountain. Still if you’re willing to hike there are always fresh lines to be had so my friend Kevin and I made a pilgrimage to the shrine to pay our respects. Alright – I’ll admit it – I’ve really been slacking on the blogging thing. After three years where the I didn’t get out in November due to poor snow conditions, this year has been a very refreshing change of pace. Steamboat set a snowfall record for the month and numerous Colorado resorts were way ahead of typical year to date totals. 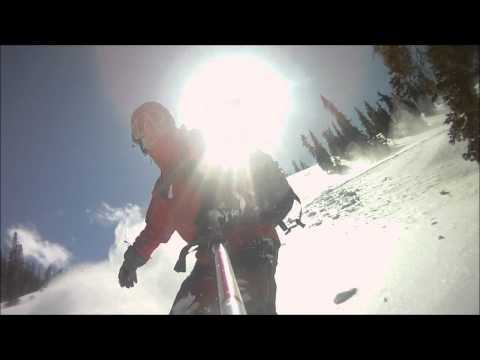 I was personally lucky enough to get in 6 days 5 of which were legitimate powder days. So why no posts? You know the old saying “powder has no friends” – well actually in my case while powder has lots of friends – most of those friends have jobs and can’t ski/ride during the week. Thus I often end up riding by myself and that doesn’t make for great photo opportunities and this blog without photos is just a lot of cold air. Opening day at Vail was a perfect example of this because despite giving my ski associates plenty of notice, no one was able to make the trip with me. Vail opened with over a 1000 acres and bless their hearts, groomed very little of it. 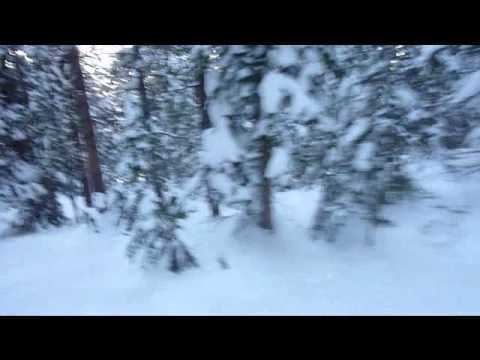 I immediately headed to Game Creek Bowl and was pleasantly surprised to find all the northside trees totally rideable so spent a very fun hour or two laying down first tracks through the woods some of which I captured on my camera in the video below. Vail has since opened almost the entire mountain with the exception of the new chair 5 lift which will open this Friday. I caught the opening of China Bowl the day before Thanksgiving and even though I had company on that trip it was so cold that the price of getting any pics or video would have included frostbite which is where I draw the line for my faithful readers. Sadly, I missed the opening of Blue Sky Basin this past Friday but heard it was quite fun – all in all, Vail is off to a great start. All my other days this month were spent at my favorite backcountry paradise, Berthoud Pass. I’ve documented many a fine day at the Pass on this blog so I won’t go into any details here other than to say the hill is already in great shape and am looking forward to future fabulous forays in the coming year. Thanks to everyones’s favorite forecaster, Joel Gratz, I was able to put together the footage below of a typical run down Hell’s Half Acre. And none of those whoops were added in in post. As much as I enjoy summer and mountain biking in the beautiful Colorado Rockies, I’d be hard pressed to not trade it all for one good powder day – that’s why they call it an addiction. So when I saw shots of knee deep snow from a late October storm floating around the internet I knew my mountain biking days were numbered. In particular I heard rumors that Berthoud Pass was once more open for business and after a warmup day at ABasin earlier this week, I decided it was time to see if the rumors were true. I had heard from my favorite weather forecaster that while there was good exercise to be had at Berthoud, I shouldn’t count on a big powder day. Thus when I casually headed down the first run with sunglasses on I was pleasantly surprised when my first big turn blew up enough snow to blind me the rest of the way. Thanks to Hell’s north facing exposure the snow stays soft for a long time and because it takes some effort to get there, there is generally untracked left when you arrive. Today was no exception as that old good time feeling came flooding right back – back in the powder again. Of course, one good turn deserves another so we were raring to get some more as soon as we could overcame the biggest challenge of the day – procuring a ride back to the parking lot. Winter Park not yet being open is a double whammy; more locals on the hill combined with reduced traffic over the pass means the thumb line tends to stack up and pickup trucks with friendly drivers are your only hope. Eventually our ship did come in and round two was even better than one as we now knew what to expect and this time I had my goggles on for greater viewing pleasure. This is not to say that there were no rocks or hidden obstacles – my copilot Mike was rudely tripped up and I added a few new scratches to the bottom of my board but certainly nothing to keep us from seriously considering not taking a third run in the sweet early season powder. Since Hell’s was so good we didn’t consider going elsewhere although they were tracks headed out in every direction. As John Candy once put it “when something works for me I stick with it” so back up to the top of Hanging Meadows we went for one more photo session. The third time was definitely the charm as well I’m sure the fourth, fifth and sixth times would have been had we had the legs and time to hike it again, but we were more than satisfied with what the snow gods had given us this day. After all it’s only early November and while I’ve ridden Berthoud in October before, the last two years my board didn’t even come out of the closet till December so I’m counting my blessings. Once again, I got a little taste of heaven in Hell’s Half Acre! I pride myself on catching any resort powder within two hours of Boulder so was mighty conflicted when I saw Vail called 9” in 24, 14” in 48 on Sunday morning as I also pride myself on not getting trapped in weekend traffic on I-70. As anyone who has spent 5 hours getting home on a Sunday night can testify, I-70 can really ruin the buzz of a good powder day. So, since I was going solo and it was already snowing in Boulder further complicating the drive, I reluctantly decided to pass. However, I was now totally infected with the powder bug and thus by Monday had to go get some tracks and knowing the resorts would be long cut up I once again headed up to Berthoud Pass for some fresh turns. Two weeks ago I posted a blog about a leisurely tour I took of Berthoud but since this time the majority of snow had fallen on Saturday and Monday was a national holiday, I knew the pickings would be slimmer and would require a lot more effort to find untracked. Sure enough, on the drive up I could see that Floral Park had been heavily tracked particularly where it opens up skier’s far left. Still it seemed worth a shot and decided to hike way out but cut back skier’s right into the thicker trees to get some freshies. It worked like a charm at the top, got that sweet powder feeling going and thus didn’t mind when I ran into a lot more tracks down low. Got a ride fairly quickly and decided to head to my favorite Berthoud area – Hell’s Half acre. Hell’s has everything I want in a ski area – gladed trees, steep chutes and lots of powder that is constantly being refreshed by the wind. I usually head to North and Sentinel chutes first as the the Fingers, Choke and Knuckle need a ton of snow to be rideable and now that no one is bombing them are incredibly avalanche prone. I generally pass on the Mines as well because besides being another avalanche trap (it seems like there’s a fatality there every couple of years) it requires a several mile (7?) traverse back to the highway which is not much fun on a snowboard. Amazingly enough, there were still some cleans lines left in the chutes particularly on the edges which resulted in a major face shot that had me quickly searching my memory for where exactly the trees below me were positioned.